Create your Dashboard with few clicks! With the Custom Dashboard Wizard you'll be able to create your dashboard also without any programming knowledge. 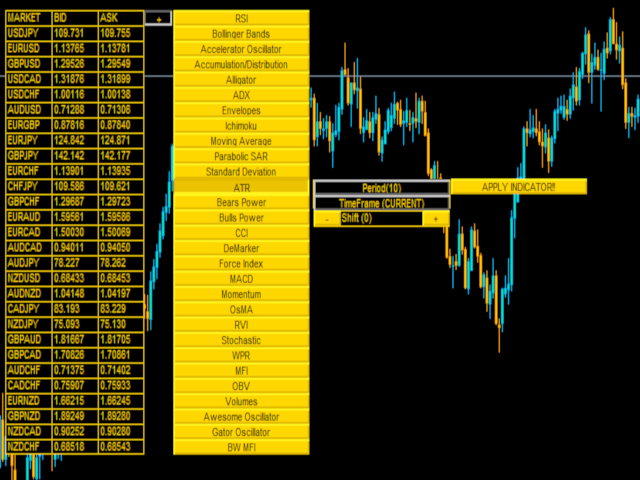 This indicator/panel will give you the possibility to add/remove the values of the Metatrader4 standard indicators in any time frame you like, with any value you like and in any market you like, just be careful about writing the market name exactly as it's written on the list of your Market Watch. On the right of the main panel you'll notice a button marked with + . Clicking on it will open a list of buttons representing the platform standard indicators. Now you are able to choose the indicator you like, applying it on the new column on the right, setting all the paramters to apply it after have clicked on the indicator. (please watch the video for more infos). Once chosen indicator and parameters click on the button "apply indicator"...and there you go!! The limit of the wievable indicators is given only by the power of your cpu and your monitor! Possibility to create your own personalized Dashboard wihtout any programming knowledge!!! Markets to analyze. As said above, you can analyze any market you want, listed on MarketWatch (up to 60!!). You'd like to add a Custom Indicator? Contact us and you'll receive your own personalized version!